Sage 300 is an enterprise business management software suite that includes integrated functionality for financial management, sales, customer service, distribution, inventory, project and manufacturing, with business intelligence. Sage Visual processes, automated workflows and document management, and communication tools are features available in the system. Pre-defined process flows can be used, or you can easily create custom process flows specific to your business. It is designed to support global organizations with multiple companies, sites, languages, currencies, and legislations. Customizable and add-on modules extend software capabilities, and it interfaces with Sage CRM. 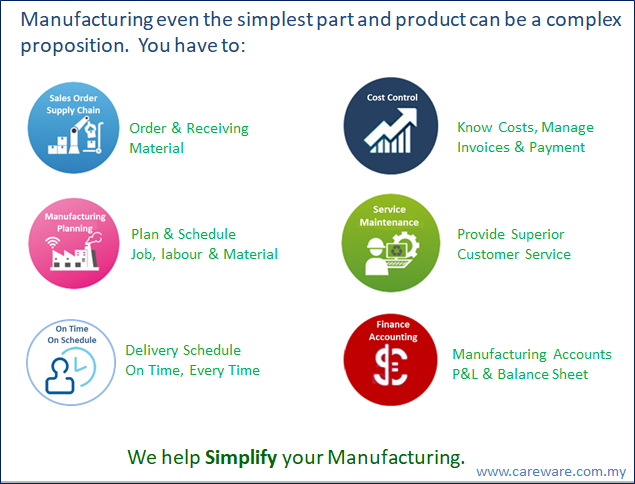 To learn all about Sage 300 ERP solutions contact CAREWARE Account Manager today by calling (03) 27143855 or by emailing sales@careware.com.my There are multiple licensing options; one is sure to be a perfect fit for your company.